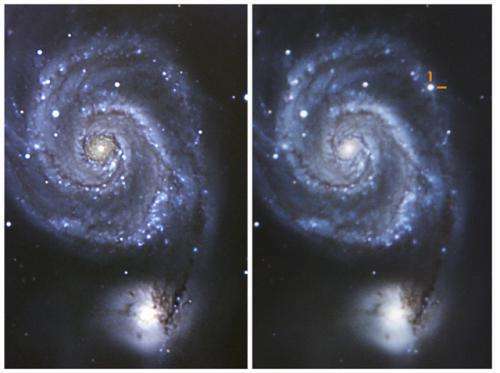 Due to its proximity, SN 2011dh in M51 was one of the brightest and best studied supernovae of 2011. It was classified as a type IIb supernova, that is, it showed hydrogen lines in the spectrum at early times, and then evolved into a helium-dominated spectrum. This is indicative of a progenitor star that has lost most of its hydrogen-rich envelope prior to the explosion. By searching through archival images obtained with the Hubble Space Telescope before the supernova explosion, two groups of astronomers independently detected a source at a location closely matching that of the supernova. Photometry of this pre-supernova source is compatible with a YSG star. If it is indeed the progenitor of the supernova, the question arises as to how such a star would undergo an explosion. Stellar evolution models predict that stars massive enough to produce a supernova explosion by core collapse should end their lives as red supergiants—for the lower mass range—or as a compact blue star—for the larger masses. The YSG phase is an intermediate, short-lived stage in evolutionary models of single stars, during which no supernova explosion is expected to occur. Moreover, based on early optical emission and radio observations of SN2011dh, some authors claimed that the actual progenitor must have been a compact object. 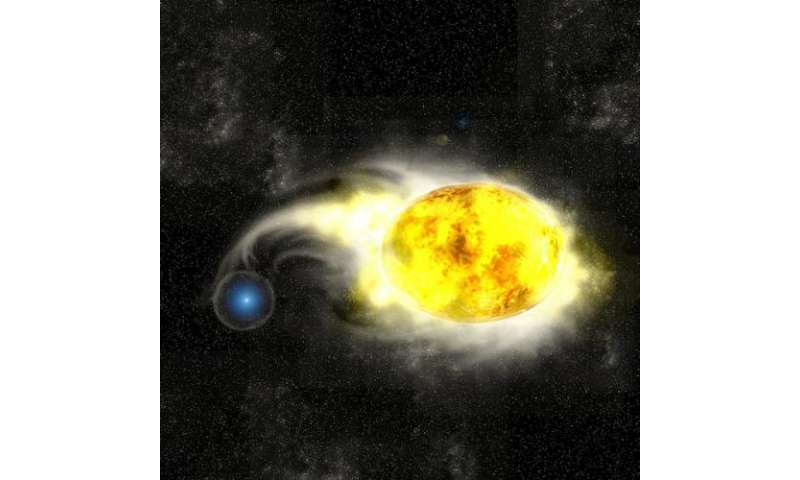 Therefore, the detected YSG star could have been a companion of the exploded star, or even an unrelated object that matched the projected supernova location by chance. In this work the authors have presented evidence that the progenitor was an extended object, of radius compatible with that of a YSG star, contrary to the previous theoretical models. This was done by modeling the early-time optical emission using hydrodynamical calculations. The observed light curve is reproduced only from the YSG star hypothesis. 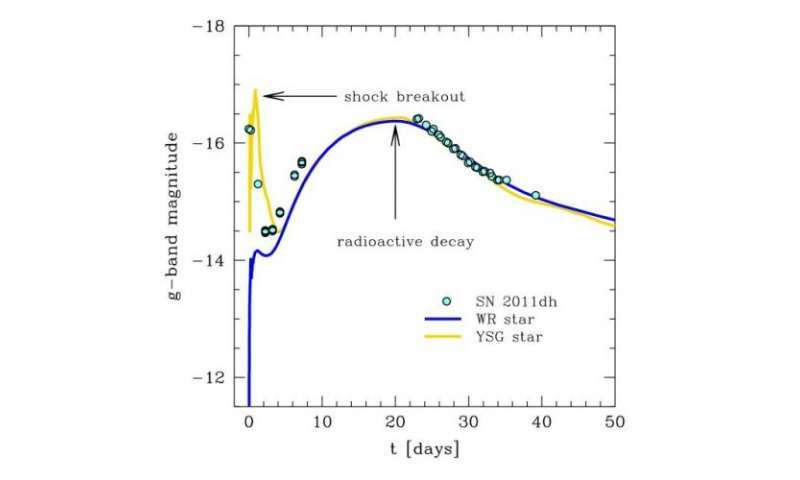 Now, these findings led to two new questions: (1) how did the star lose most of its hydrogen envelope?, and (2) how could a YSG star of those characteristics explode? Theoretical light curve for a yellow supergiant (yellow) and blue compact (blue) progenitor compared with the observations of SN 2011dh (cyan points). From the figure it is clear that the progenitor of SN 2011dh needs to be a yellow supergiant in order to reproduce the observation. Related with question (1), there are two main mechanisms proposed for stars to get rid of their outer layers: strong winds, and mass transfer in interacting binary systems. For the former mechanism, it is believed that the star should have a mass at the time of birth larger than approximately 25 times the mass of the Sun for the wind to be strong enough. Hydrodynamical models, however, set a strong constraint on the mass of the progenitor star. They found that its core could have not been more massive than 8 times the mass of the Sun, which implies that the initial mass of the entire star was less than 25 times the mass of the Sun. With this possibility ruled out, they tested the alternative of a system in which the progenitor transfered mass to a close companion, thereby losing most of its outer envelope. The binary scenario has the advantage of introducing a natural mechanism for lower mass stars to expell their envelopes. With the aim of solving both questions above, Bersten's team carried out stellar evolution calculations for a system of two massive stars in a close orbit, in which phases of mass transfer occur. By assuming a system of stars with initial masses of 16 and 10 times the mass of the Sun, and an initial period of 125 days, they were able to obtain a configuration for the mass-donor star —-the one that eventually explodes—- that matches closely the observations of the YSG object in the pre-supernova images and has a core mass that is consistent with their hydrodynamic modeling. Moreover, the amount of hydrogen left in the envelope of the exploding star was in the correct range to classify the supernova as type IIb. This is in contrast to a single star that evolves to a red supergiant. Finally, the binary models predict that the accreting companion object should be a massive, blue star at the moment of the supernova explosion. Because of its high surface temperature, the companion star should emit mostly in the ultraviolet range, with negligible contribution to the total flux of the system in the optical range. The companion was faint enough so that it was not be detected in the pre-supernova images of the space telescope. Their calculations thus predict that in the near future, once the supernova has faded enough, the companion could be discovered with deep observations in the blue range of the spectrum. This would constitute a definitive test for the validity of the model. "The present results reveal the necessity and importance of further studying the evolution and explosion of binary stars," Bersten, the first author of the paper saids,"I look forward to the observation that will confirm our prediction."